World-Mysteries.com presents first chapter (all about the errs of Creationism) and 3 sections from the anti-EVOLUTION chapter from a new book being written by Doug Yurchey. How can Creationism be true? In the Dark Ages, not that long ago, there was only one viewpoint; there was only one agenda. The united Churches of various countries ruled supreme. They were ‘God,’ exactly as those with too much power feel that they are today. The Church was a solid, unchanging monolith. Today, people are financially ruined; back then, they burned you at the stake for any type of heresy. ‘They’ (authorities) had a full range of public tortures to teach the masses a lesson. This was the Holy Church. They took your money and if you were not careful; they might confiscate everything you own (like the I.R.S.). This writer must ask a few questions to readers. What time is it? What century is it? Creationism might work for those of the pre-Renaissance. Creationism does not function well in the days of the post-Renaissance. How can any philosophy not include science? How can any view not incorporate some strands of established, scientific truths? We do not have to swallow classic Science or Darwin’s version of Evolution, but most real facts clash with general Fundamentalism. Churches may disregard certain disturbing facts, but would their deity? What kind of God do Creationists have that ignores universal facts? The Supreme God, by definition, has set the universal stage and is aware of every scientific fact in town. Then, anything TRUE is of God; God, that incomprehensible thing that is the Ultimate Scientist? The God-force certainly does not possess the ignorance of men who believed the Earth was flat. Would not God condemn superstitious ignorance and appreciate scientific wisdom? By this logic, if we really want to get closer to religious truths (and God)…then, we should not follow a ‘spiritual’ way of life…but, a ‘scientific’ path. What is wrong with a union of Science and Religion? Answers do not reside exclusively in one camp or the other. There exists only ONE truth and it must stand in-between Evolution and Creationism. Theological truths are not black or white. Eastern philosophies (such as metaphysics, reincarnation, etc.) are middle-truths since they are opposed by Church and State. The point is to not side or place all of your faith in one (Western) extreme or the other. A middle-of-the-road attitude tends to be a correct code. Creationism is a mad, blindfolded monster from the Dark Ages. Any modern person can slay Creationism; even a child. Why would we want beliefs anywhere near our great, great, great, great, great, great grandfather’s views? Remember what time it is. Are we not modern men and women? Remember to keep your eyes and mind open. Too many people have died because they believed they knew the truth and THE CHURCH KILLED THEM! Giordana Bruno was an Italian philosopher; born in 1548, not far from Mount Vesuvius. His controversial work included a belief that the universe was infinite and the Earth orbited the sun. Bruno became a Dominican priest. He coined the phrase, ‘libertes philosophica,’ which means the freedom to think/dream and make philosophy. Chief theologians, at the time, and the pope’s Inquisition convicted the heretic. He was imprisoned for eight years and then taken to the palace of the Grand Inquisitor in February, 1600. After given numerous opportunities to recant in order to save his life, Bruno refused and was burned at the stake. Bruno suffered a terrible demise that Copernicus, Galileo and Martin Luther did not have to experience. A ‘Giordana Bruno’ reference has to do with where the Church is coming from; its godforsaken, cruel history. How many elderly were deemed witches or warlocks and ignited on fire by the Churches? Even Jesus Christ was persecuted and killed for philosophic clashes with Sanhedrin. Isn’t it time we question the Church’s right-winged Fundamentalism and each aspect of its principles? Could the Church survive against self-Inquisition and righteous judgment? (What freedom to be able to print new views without rocks being thrown!). Given that prelude…shouldn’t we QUESTION the basic, fundamental doctrines of Creationism? Creationism is too simple of a philosophy. It is traditional dogma and passed on opinions from a dim time period. How could Life, the Universe and Everything have been a simple process? Where is some science? Shouldn’t complex sciences have been involved? Where is even a glimmering ghost of science in Fundamentalism? The quick formation of Earth by God, Garden of Eden, Adam and Eve were naively accepted as fact by most people before the 20th Century. A modern view should be one that reexamines archaic creeds with future eyes. We should expect the unexpected and prepare to toss old-fashioned conventions in the Recycle Bin. Author’s note: This writer is not an atheist. But, I sure want a true belief-system above the level of a witchdoctor…or more advanced than the 4th Century. Consider how long the war has been waged between Church and State, Religion and Science or Creationism and Evolution. We can read anti-Creationism information exactly as we can read anti-Evolution information. One side attacks the other as if their viewpoint is the right one and there are, of course, only two choices. In this text, religion or fundamental Creationism will not be criticized because of an Evolutionary point of view. In this text, Darwin Evolution and ‘primates’ will not be criticized from a Creationist point of view. BOTH Science and Church cannot be correct on the single question of our genesis. We will be in search of one harmonious conclusion that explains the human mystique. One definition of ‘Creationism’ is purely a rejection of Darwinism. Because there are those that oppose Darwin and ‘Natural Selection,’ does not make them Creationists. ‘God did it,’ should not be a sufficient answer to our unknown origins and the mysteries of the universe. We should demand more as members of a modern age. Creationists presuppose that the Supreme God created the Earth and the rest of the Universe, the ‘heavens and the earth.’ Maybe God was not responsible? Possibly, other life forms built the cosmos. Is GOD as the ‘Builder of All’ too damn easy of a concept to be true? How does the farthest extent of GOD fit so smoothly into our infinitesimally small brain? The feat is impossible. Creationists believe that our planet is a matter of thousands of years old and not billions as is the scientific belief. Known, biological life on the planet is probably tens of thousands of years old. The age of Earth is a different story. Our Earth, old ‘terra firma,’ has experienced a vast scope of time. Who says our ancestors were the planet’s first kingdom? Lemuria or Mu, the starting-empire of the Asian Race, precedes the Indian civilizations of Atlantis and was centered in the Pacific Ocean. We can extrapolate other, possibly alien empires living and dying out long before the Lemurians. Slight traces of intelligent societies, hundreds of thousands of years ago, have been ignored or given no credibility by scientists. Unfathomable civilizations could have come and gone on terra a million years ago when conditions were utterly different than what Earth is like today. A literal few thousand years from the beginning of the Earth to its final form does not sound plausible, naturally. But, if planet-builders (Slartybartfast in ‘Hitchhiker’s Guide…’) were capable of manufacturing entire worlds, then creatures would be churning planets out of gigantic factories in space. Whatever means of planetary integration or materialization, the birth of Earth and other worlds might not be natural/slow-moving events. Planetoids may have been quickly built, SYNTHETIC constructions. Venus and our Moon break most laws of physics and reason. Yet, enigmatic Venus and Luna continue as unbelievable oddities in the heavens. Study photos of Saturn’s moon Iapetus if students want to observe a cosmic body that is ARTIFICIAL. We can visually see its unnaturalness. Very close examination shows irregular, but unnatural architecture! The possibility exists that planets could have been erected in thousands of years or LESS, but not by the fire and brimstone God of the Christians. Advanced humans, aliens or any number of high-tech angels might be in charge of manufacturing planets. Have the gods seeded a human-culture on Earth? Do aliens own the planet? Is Earth their property? Are we? Strange at it sounds; there are aspects of fundamental Creationism that could have its true points. If planets and moons are ‘artificial’ constructions, then their fabrication into existence did not require billions of years as naturalists contend. Naturalists may be ‘barking up the wrong tree’ when they erroneously view an unnatural world and only see a lifeless universe. Maybe the infinite universe is filled with more than gas, dust and debris? Maybe nature and the universe are alive? Life could be everywhere. What if every molecule of nature, from atoms to cosmic bodies, is unnatural and has been synthetically produced? What if we only presume nature comes naturally? If future generations of ancient astronauts lost their high-tech and fell upon barbaric times, their primitive descendants could not conceive the phenomenal story of the first/great Indian Societies. The complex world of yesterday was gone. Now, there only remain savage barbarians of the Dark Ages. Historic stories, records, myths, legends and memories from long ago had to be simplified for a much simpler age of people. Idyllic EDEN might be a true report of a far, buried memory. Our beginning was a Paradise. The ‘Garden of Eden,’ the ‘forbidden fruit,’ the ‘serpent’…could be watered-down ways of telling ancient tales of history to new, naive generations. Were the ‘forbidden fruits’ highly destructive weapons, the fruits of knowledge? Was it a Tree of Knowledge (technology) that could be used for good or evil purposes? Did the long echoes of time change a complex Homer’s Odyssey into a simple, children’s story? We have to stop being childish. We have to start thinking for ourselves and finding our own answers. We have to stop being sheep. Biblical Eden parallels legendary Atlantis. Consider these two legends. Plato wrote of Atlantis, our mother-civilization. Psychic, Edgar Cayce confirmed Atlantis as the root race that later split into the Pre-Egyptians and Pre-Incas. Both stories were the beginning genesis for the human race. Both stories of a technical utopia and garden paradise similarly coincide. Atlantis and Eden could be reflections of the same story or same historic events; one record of real happenings and one told to simpler generations to come. Both legends suffered a disastrous end as humanity had to depart in disgrace. Author’s note: How can there truly be any separation between Church and State? The idea of a ‘separation’ is fallacy, an illusion, a convenient mask to what is really going on in the world. Secret, governing bodies are a two-headed snake; Church and State. The problem with Creationism is not that it is wrong. (As this writer’s tongue gags-in- mouth), ‘In many cases, Creationism is correct and has it right. The problem is a simple, easy, uncomplicated, basic, almost superstitious viewpoint of traditional Fundamentalism does incredible damage.’ Even if religious Creationism has valid points, to dilute the fantastic occurrences of prehistory into a pale fable for the masses (fraught with misconceptions) causes immeasurable harm. It has created a billion simpletons, the religious-right that could not be more wrong. Why are apes, chimps, monkeys and other tree-crawling ‘primates’ ALIVE today? If humans originated from apes, wouldn’t anything that resembles anthropoids be only found in the fossil record? We certainly should not be able to shake hands with our very distant, primordial ancestors! Scientists/anthropologists (that simply want to counter Creationism) point out the similarities between humans and apes. Rather, we should be aware of the great gulf between the two or the numerous DIFFERENCES among humans and apes. Remember, we exist at the same moment in time with the families of apes. What could have drastically changed one early group of ‘primates,’ while unaffecting the other in the same environment? The SAME environment should have produced similar humans, not generated vast differences between Monkey and Man! Any physical semblance between us and (alleged) ape ancestry should have been stripped away a long, long time ago. Darwinists or classic evolutionists are not correct. If they were right, gorillas/baboons/orangutans and the rest of the ape varieties would not be living creatures today. They would be long dead and long gone. The only natural images of apes should be exclusively found in prehistoric, fossil records. The fact that monkeys are with us presently and we see them eat bananas is evidence that Darwinism makes little sense. Logic tells us that the idea of ape-origination is surreal and irrational. No matter how often a genesis from ‘cave-people’ is drummed into our consciousness, the assumption remains untrue and unproven. Repeating an error does not increase its validity. One: Various types of proto-human forms such as Australopithecus, Cro-Magnon, Neanderthal, Homo erectus, etc…all existed at the SAME time period and have been found to exist at the same archeological level! Two: Cro-Magnon’s cranial capacity is considerably LARGER than modern humans! It is physical evidence that Cro-Mags were smarter than us today! Let us investigate point number one. Darwin Evolution is based on the concept of very slow change over long epochs of time. Like not seeing the movements of hands on a clock, we could barely perceive how generations altered in their physical forms. 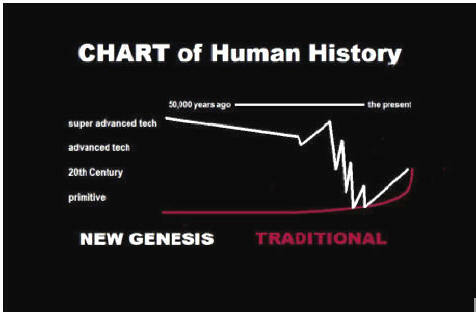 Human progression or human-change, (always moving forward) according to evolutionists, did not happen quickly. The Darwin Theory is centered on the idea that one proto-human form dominated the planet for ages and was later (slowly) replaced by an evolving and superior form of primate. ‘Survival of the fittest’ is the belief system. The stronger type of prehistoric human wiped out the inferior primates that previously ruled the Earth. Standing upright, the use of simple tools even as weapons, adaptation were all utilized so that the ‘next’ or future-form dominated the planet. Evolutionary processes required ages, many millennia and unfathomable amounts of TIME…according to the theory. Nothing in human history happened quickly or suddenly to Charles Darwin. As point one reveals, the secret truth is that all of the above mentioned (alleged) primates have been discovered to live at the same time period. Different primates, thought to have each dominated for eons, were found to co-exist. People of ‘science’ cannot harmonize the paradox. The truth means their precious Evolution as a creation-theory is out-dated, very ignorant and the concept of ‘primates’ is absolutely WRONG! The fact that varieties of so-called ‘primates’ shared the planet; were found on the same level of rock strata and same time period means we need to rethink our view of human history. Let us investigate point number two. Brain size determines intelligence. By measuring the capacity or volume of space (size) of the brain cavity, we can determine the intelligence of the species. Dolphins have huge, complex brains and are incredibly intelligent. The brain size of these beautiful mammals rivals the size of modern humans. Gorillas and orangutans have modest-sized brain cavities and are reasonably intelligent. Unintelligent creatures have small brains; it is as simple as that. Now, see if you can fit the idea that the brain size of Cro-Magnons is LARGER than modern humans into traditional history. You cannot do it. The idea that one group of supposed primates were BRAINIACS and were actually smarter, more sophisticated, than people of the 21st Century…is unsettling. The large-brained Cro-Mags make no sense if what we are taught is true. What we are taught is not true and we must question everything that we are force-fed. Neanderthal, Australopithecus and other ‘simpler’ types of humans were not large-brained. Consider that Edgar Cayce, in his book on Atlantis, wrote that the ‘Cro-Magnons were Atlantean man.’ The faithful, talented psychic did not suggest that the other forms were Atlanteans, only the Cro-Magnons. What is the significance of large-brained Cro-Magnons? It means that a super-civilization, a utopia, a technical Eden really happened. We needed other areas of the brain (unused today) to handle and deal with a Super Society. To build titanic wonders in impossible places; to move mountains; to construct pyramids; to master space travel, cloning and draw vast amounts of electricity out of nature required super-brains. If the New Genesis concept is valid, these ancient supermen and superwomen had to have used idle/dormant portions of our modern brains. Imagine a psychic-society without the need to read or write; we would know and be able to telepathically communicate over long distances. Imagine a smoothly-running paradise of brainiacs. Now, imagine worldwide disasters happening to your great empire of Atlantis over time. High-tech ages suddenly collapsed and came to total standstills, such as the Egyptian/Incan and Mayan empires. On the order of how a global nuclear war would ravage today’s civilization. Our modern world could be demolished back into the Dark Ages; back into the caves. If human history had to endure cycles of floods, ancient nukes, wars and possible ‘electric’ disasters (destruction of the World Grid? )…you and your children might be thrown into a barbaric age. Over much time of having to adapt to a primitive environment, simply to survive, we would lose our natural mental abilities. Our super-brains would actually atrophy and SHRINK because of non-usage over time; because our Super Society blew up in our face and was no more! We are humans and the few survivors lived in caves long ago. We did not begin in caves; rather we were forced to retreat to caves for survival. We kept producing generations of offspring, but our fantastic Metropolis was gone and so were our telepathic/telekinetic capabilities. The PHYSICAL fact of ‘large-brained’ Cro-Magnons supports the idea that we were once gods, but have long lost such high stature. One more time, evolutionary scientists are not a little wrong; they are very wrong. We have been trained to believe that early forms of proto-human had ‘sloped foreheads.’ Anthropologists do damage by teaching that all primates had caved-in, sloped foreheads and were poor savages with small brains. One particular group of cave-people had large, huge, ‘bulbous’ foreheads and they were the Cro-Mags. Modern men and women are not at the top of the evolutionary chart when it comes to brain size. We stand (maybe as inferior apes) below the level of the Cro-Magnons’ brain size. It is an error to refer or to picture Cro-Magnons as primitive cave-people in any way. Imagine them as space travelers, ancient astronauts, builders of pyramids or gods in the ‘flying chariots.’ Barbarous times were thrust upon them because their great empire was destroyed, as we will outline in this text. If nukes went off today, we would be thrust into similar dire conditions. The survivors would be forced into primitiveness because their mega-technological world got out of control and imploded! We hear the words ‘Stone Age’ and think of primitive cavemen and dinosaurs. We do not think titanic, impossible structures of the ancient world that our most powerful machinery cannot duplicate! We have been virtually and subtly ‘brainwashed’ with the view of primitive primates. (Possibly, educators feel ‘superior’ and egos assume that they are the crown of Creation). The true answer to the above question is ‘B,’ flying through space colonizing and cloning. But, most people ‘buy’ the theory of primitive cave-people for the same reason they buy products. ‘Evolution and prehistoric cavemen’ are what is advertised. People feel safe and comfortable with the mainstream. Vast numbers of tourists visit Giza, Stonehenge, Easter Island, Teotihuacan and many other STONE constructions of prehistory. Tour guides tell the visitors, ‘look how remarkable early Man was; they could accomplish so much without the use of modern technology.’ When we examine such statements, an unmistakable contradiction should be realized. Possibly, the answer to ancient mysteries is that our ancestors possessed overwhelming technologies even more advanced than the present? When we color the Pre-Incans and Pre-Egyptians with a brush of ‘barbarism,’ we only display our own ignorance. We should give our ancestors much more credit. Can we stop insulting the Pre-Incans and Pre-Egyptians by finally understanding that they were better than us? How were the massive megaliths of the Old World cut and transported? Tour guides and brochures will attempt to convince you. They will provide ‘reasonable,’ fundamental techniques as solutions to the puzzle. Ramps, rollers, levers, pulleys, ropes, slaves and animals should do it. Rarely will mysteries be left as mysteries. Authorities will never report, ‘We do not know.’ Instead, ‘they’ will fill-in enigmas with complete misinterpretations and pure mistakes that are no better than the Flat-Earth Theory. A theory including ‘super-lasers and anti-gravity’ provides reasonable answers as to how the huge monoliths were shaped and moved when you consider the physics (weights) involved. Traditional academicians would never accept such notions as modern or above-modern technology existing so long ago. One example of a typical misunderstanding was demonstrated in a particular documentary concerning the Incas. Researchers excavated the area around enormous, 100-ton, stone blocks that comprise the unbelievable fortresses high in the Andes. Thin-air sites such as Ollyantambo and Sacsayhuaman were studied. But, the problem was that the scientists foolishly believed that the ground near the giant-rock fortresses would reveal clues about the original builders. Yes, a few simple tools and bowls were found. Scant evidence of not-so-advanced Indians was discovered. A few relics of simple tribes in the shadows of mountainous sites containing building blocks weighing at least 100-tons each…have little to do with the original builders of Ollyantambo or Sacsayhuaman. The basic discoveries could very easily be recent while titanic bases of megaliths are more than 10,000 years old! One is certainly not connected to the other since oceans of TIME probably separate the two. A few, meager tribes may have endured the hostile environment of the ‘high plain’ Altiplano out of sheer inertia (reincarnation?). Consider that STONE is the perfect material if the architects want the structures to last ages and ages. After many millennia of wear and tear, after much environmental weathering and erosion, stone constructions will endure. Sandstone, limestone and granite are basically permanent. How long do our present-day buildings last? A hundred years? Not really; castles have been around for more than a thousand years. Castles are made of stone. Our ancestors built structures that survived the ravages of time. An intelligent (culturally-advanced) society builds in stone, rather than in softer/less permanent materials. The most important buildings of your civilization should be constructed in rock to last the long course of time. You would desire that the most essential facilities, such as those connected to power/communications, endure and function. They need to be maintained and stand up to Great Floods or nuclear threats. Thick, stone walls provide the ideal atomic bomb shelters. Stone was the perfect medium for the gods. Stone has CRYSTAL (radio) properties and can hold an electrical charge. Stones can be highly electrified; stones can be highly magnetized. Standing stones can carry an EM signal and pass on the information/power to the next stone in a grid of standing stones (induction). Stone was the perfect material for gargantuan statues that only appear as idols to honor pagan gods. The rock architecture and pyramids’ true purpose had to do with functioning as UTILITY POLES! Before we view the Stone Age as a ‘primitive’ period, we have to think again. Students should realize that the first obelisks seemed to be built for the gods. The Stone of the South in Baalbek, Lebanon weighs more than 5000 tons. Some estimates have placed this one giant carving at 8000 tons! How much did the original rock weigh before it was carved, 15-20,000 TONS? The sculpted (sliced) weight is on a scale that our technology will not master for hundreds of years! The ancient obelisk rests on its side and is barely noticed to taper to a smaller width. Stone of the South looks more like the large foundation of a colossal Greek monument, than an obelisk. Also observe numerous ‘island’ cities of the Maya, Olmec and Toltec Indians in the dense jungles of Central America. The stonework is obviously on a level far above what can be built presently. Note the placement of stele, such as in the courtyards of Copan. It is not difficult to imagine that the squared, ornate totems operated (literally) as utility poles. They were placed in similar locations that resemble where we place our (wired) power poles today. See if you can look upon Mayan, stone plazas, pyramids, cities and perceive them not as mere ‘ceremonial centers’…but as wireless, Electro-Magnetic powerhouses. A few of the stone wonders, surrounded by intense vegetation, have row upon row of squared-off steles. These stunning rock pillars are aligned with laser-perfect precision! Lasers were probably used in their making and placement. Visiting tourists walk between rows of perfectly-straight, little towers of stone. Stele monoliths may have once oscillated carrying huge amounts of electricity. Mayan buildings, with many rows of stele, could have served as generating and distributing POWER STATIONS. The problem with the age of stonecutters is that we have been reinforced to believe these early Indians were savages that practiced human-sacrifices and cannibalism. Implausible, stone altars in the so-called ‘ceremonial centers’ are thought to be where ‘ritual’ killings occurred. Traditional archeologists point out where they believe blood poured down stone troughs in the natives’ tribute to pagan gods. We only ASSUME this view; reality is a matter of relative perceptions. If researchers had the proper view, that Mayan and Incan civilizations were high-tech races, then our American ancestors would no longer be savages. Today’s scientists completely misinterpret the ancient ‘flying’ Indians because they do not understand the power system that fueled their society. How can we believe that the pyramid-manufacturers were anything less than an elegant race of super astronomers and super scientists? ‘Human-sacrifices’ are a big misconception. Indian savagery certainly happened hundreds of years ago among the far descendants of the Aztec. But, those ‘recent’ Indians were not the pyramid-builders and stone transporters from much earlier times. The Indians the Spanish discovered hundreds of years ago were the long, lost, future-children of the Maya pyramid-builders. Pyramids are thousands of years old. Once again, so much TIME separates various cultures. Human history, which includes extremely intelligent humans, is so much older and more extensive than we have been taught. If a space-traveling race of people were to colonize another planet…they would not bring with them construction materials, giant engines and great power sources. They would use their high level of knowledge and build with materials found on the new planet. Natural power sources would also be employed. The colonizers could have the ability to tap into energy flows, such as EM fields, found on the new world. Could this scenario apply to the ‘seeders’ of Earth and the first Indians? The idea of a primitive and barbaric Stone Age, whatever that is, should not be confused with a time of (real) technical gods and goddesses. There once was an idyllic age when our distant ancestors could literally move mountains; a momentary Heaven on Earth? Possibly, the great megaliths were transported by mind-power initially and then later (in a less advanced age) by machines? We will still imagine images of dinosaurs, volcanoes erupting and ape-like cavemen every time we hear mention of the ‘Stone Age.’ Films such as ‘10,000 B.C.’ and the ‘Flintstones’ only continue ignorant stereotypes. We should also be aware of another, very different perspective regarding the remote past; a more enlightened view of what came before. The proof is in STONE that our ancestors were much more advanced than modern men and women. Readers may be confused about including Egyptian and Mayan stonework in a section concerning the Stone Age. One evokes pictures of cavemen with crude tools while the other demonstrates ‘remarkable’ building techniques by way of an advanced knowledge. Our ancient ancestors worked in stone. This level of construction is so far removed from anything simple or primitive. Yet, we tend to lump our long lost STONE workers into the category of barbaric pagans. Who knows how old the perfectly-cut cities are of the Mayas and the Egyptians? We do not know the age of prehistoric, stone complexes. We know not when the large megaliths were cleaved and transported many miles to their final destinations. True ages of these masterworks go off the scale. Students will read plenty of guesstimates in a wide range of schoolbooks. They will alter in ‘time periods for the Mayan empire or time periods for the Incan empire.’ Dates will also change depending on which decade the books were written. Do not believe fluid ‘dates’ at face value. Recognize that the Indians lived for AGES; very long cycles of time. How could Science be so wrong? Almost at face value, nearly without question, large portions (possibly majority) of people think scientists are credible. Darwinism is taught in schools everyday right along with fundamental Creationism. More accurately, both ideologies are ‘mentioned.’ Some textbooks split the page and have given each Creation system a fair platform. At the end of the day, most people (generally) feel comfortable that ‘if it is in the schools, then it is probably a reasonable philosophy.’ Certainly, the men and women of the sciences must know their fields of study better than anyone else. Do not be so sure. We must question all traditions. We have heard the common expression ‘missing link.’ The reference symbolizes failed efforts to link ape to human. How long has the scientific community tried to find the missing link? The answer is ever since the formation of Darwin’s philosophy. A few ‘Piltdown’ men later, the half-human/half-apes that connect people to the families of anthropoids have NOT been discovered. It is 200 years since the birth of the English naturalist, Charles Darwin. We will never discover all the missing links to the human-evolutionary chain because our genesis on Earth did not happen that way. Examine the next chart of ‘discovered,’ found, real, honest-to-goodness, evolutionary links. The problem is; scientists have been looking for links for a long time and there ‘remains’ only a very, very few evolutionary connections. There is not only the HUMAN missing links; there exists missing links in every type of animal! Where are the LINKS? There are too many HOLES in Darwinism, literally. Where is the mother-specie between horse and bear or between horse and cow? We should find earlier animal forms that are mother-species; simpler forms that split into specialized, more complex species. Where is the horse-bear that later split into the horse and bear…or the horse-cow that later split into the horse and cow? Earlier mother-species have not been discovered, with only a few exceptions to the rule. 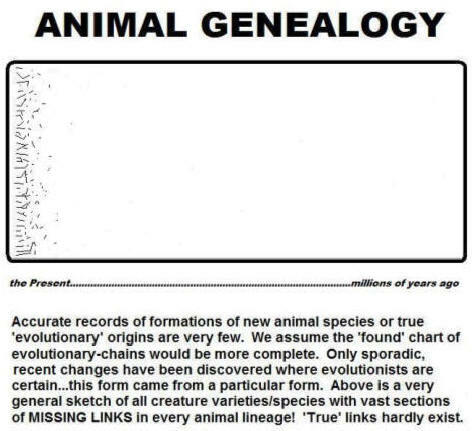 They are missing links and the many missing links in various species will probably never be discovered. Primarily because they do not exist, have never existed and history did not happen that way. Basically, a cat has always been a cat. A dog has always been a dog. The many root-species that should exist in our long past have not been found, except for a very few known cases. For the students that wonder, ‘possibly, the connective links no longer exist or will be found in time?’ Consider the extremely long stretches of time that exist in the world of ‘Darwinism.’ There should have been plenty of time for an accurate, sharp (filled-in) picture of the past to materialize in buried stone. 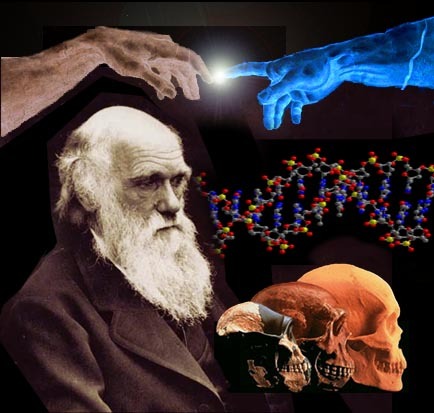 Nowhere are the complete pieces to Darwin’s Puzzle; the proven, finished ‘picture’ is not close to being realized. Why are there no archeological records to support clear change after change after change…as the millennia whipped by like slow sands in an hourglass? Why are the rocks silent? The truth is the rocks are not silent. They scream with information. We should be prepared for the unique story they reveal. The evidence, such as the ‘animal genealogy’ chart, suggests a different beginning for life on this planet. LIFE EXPLODED AT ONE TIME ON EARTH…geologically speaking, when you consider looking back a million years. What the chart implies is: BOOM...there was Life on Earth! Human life, animal life and plant life in most of their varieties exploded into existence in a relatively short time. What if human/animal and plant life were not natural, but synthetic creations? The very same can be substantiated or paralleled in the PLANT world. We also have ‘missing links’ to the distant ancestors, the mother-species of plants. Believe it or not, the (essentially) same plant species have only been with us for a matter of tens of thousands of years. Of course, prehistoric plant-types have died out; became extinct exactly like many species of animals. But, the long record of plant life from the far past is largely missing as well. Plants may not be millions of years old, but only a matter of thousands. If so, we have to change our view of life naturally beginning over long expanses of evolutionary time. The evidence implies an ‘artificial,’ fabricated human/animal and plant genesis rather than natural origins. Were we ‘seeded’ here, as previously mentioned, in a short span of time? Did someone or a group of people ‘plant’ life on Earth just 50,000 years ago? Were we placed in a Garden of Eden? Are we the future descendants of ‘space’ people? Why is life on Earth only carbon-based? Another oddity is in the fact that known life, in every physical manifestation, is CARBON-BASED and carbon-based only. What about silicon-based life? Or, there could be life based on other elements? Is life on other planets not based on carbon? After the primordial ball of Earth cooled down (if it happened that way), couldn’t there have been a whole range of proto-life forms in existence based on different elements? Weren’t they all fighting to exist if the ‘naturalists’ are correct? If there is anything to ‘survival of the fittest,’ the question remains; ‘How did carbon-based life and only CB life have won the Nature Wars?’ Not a trace of another basis is present on Earth, yet there should be. What does that signify? It could support the hypothesis that nothing is natural when it comes to life found on this planet. Every mammal, blade of grass, fish or flea could have been manufactured. The only basis is one element and only one: CARBON. The full spectrum of forms that we observe is what can be genetically built using carbon and adding the life spark. Known species, down to the tiniest microbe, could be produced from a single carbon source. Investigating ancient lore, students may stumble upon a quaint story for the Creation of Life on Earth. Egyptian god RA was responsible for generating the first ‘human’ life on the planet tens of thousands of years ago. With ‘tissue-samples’ from himself, the space traveler copied (cloned) himself and also decorated the New World colony with perfect plants and animals. The above hypothetical, as fantastic as the idea sounds, is a possibility. Such an origin story accounts for every ‘living’ thing on the old planet being carbon-based. Does the story have a real world foundation? Is the ancient lore Atlantis in a nutshell? Author’s note: This writer believes in evolution! This writer does not believe in Darwin Evolution. Things CHANGE; everything ‘evolves’ and nothing ever stays the same. There is always a process of transition. A factor of TIME has been the emphasis of many of the paragraphs in this text. We medium-sized-brained humans find it difficult to really grasp very large tracts of time and its influence. Time has a tremendous almost unseen effect, such as the slow course of a river. In a million years, the water has carved a Grand Canyon. Environment absolutely physically affects the life forms within it. Conditions of the environment can change the plants, animals and people over great stretches of time. Evolution has correctly pointed to certain animal changes that were results of the natural surroundings. Cave fish, for example, that have never experienced light have lost their eyes. They no longer needed them and are now eyeless. Environments physically changing people have occurred by the fact of different skin colors. Groups of humans lived or were stranded in a variety of temperate regions for long periods. Intense sun darkened the skin of cultures in tropical climates. Areas of hardly any sun have produced fair-skinned people. Our environment changes us over time. WE ARE NOT NATURAL BY-PRODUCTS OF THE PLANET! Students should examine the few ‘real’ charts of evolutionary transitions and not merely accept Evolution charts per se. Yes, actual changes in life forms have occurred, but the question is not the metamorphosis of creature-phylum or slight changes in a few species. THE QUESTION IS THE BIG QUESTION OF CREATION. Here, is Darwin’s error. We can backtrack a bit on the Chart of Life and notice change, but not ‘creation’ or a materialization; a something from nothing. Nature does not simply and naturally produce life from a vacuum, even if the proper elements are present. No matter how many Amino acids cook up for an eternity…the sparsest hint of ‘intelligent’ life will never happen. We can have a fish tank with only water; add the elements for life and wait forever. Fish are not going to swim from one side to another no matter how much time passes. But, if we ‘breed’ tropical fish in the tank…then, life flourishes in the right conditions. The same can be said for a virgin planet. During the long (or is it short?) course of planetary creation, life does not ‘just happen.’ Life has to be made to occur on a planet. Intelligent life will never emerge from chemical reactions. Planets can harbor a wide range of life. To contain life, the worlds must be SEEDED. Human life will never naturally appear on a planet’s surface without a little artificial inducement. Humans have not originated chemically from the inner bellies of solar material. When Carl Sagan made the statement, it was an atheist striking out against Creationism. It is a slogan, a Madison Avenue campaign, a product meant to eliminate any type of ‘intelligent act’ in the creation of humans. Star-stuff erases the possibility of an intelligent-Creator or any type of divine intervention. Star-Stuff, to Sagan, was a beautiful way to describe our Creation scientifically. The concept is as cold as space itself. Readers should be aware that the inspiration for the film ‘Contact’ and host of the ‘Cosmos’ series publicly debated against the idea of intelligent life in the universe ever making ‘contact.’ While Dr. J. Allen Hynek (coined the phrase ‘Close Encounters of the First, Second and Third Kind’) opposed Sagan. Dr. Hynek learned to accept the reality of UFOs and UFO contact. The problem with Darwin Evolution is not so much the ‘evolution’ (even though more evidence suggests devolution) but the Darwin aspect. We should not dismiss a philosophy of change; evolution is how something changes over time. The problem is when Evolution decides to answer THE ORIGIN OF SPECIES. The Creation of all living creatures great and small is not explained in Darwin’s slow-change. Do not perceive reality through the eyes of 19th Century scientists. Views of 20th Century scientists were bad enough. Neither Church nor Science has the answers to the mystery of humankind. What of the discoveries by Dr. Leakey in Africa? What is the significance of Lucy? Students can certainly find volumes of information discrediting the small ape creature referred to as ‘Lucy’ by the anthropological scientists. Lucy serves as science’s strong desire to unearth the hallowed ‘missing link,’ their Holy Grail. Isn’t this the same error of digging up one bone and presuming an entire dinosaur? Are they not assuming too much with Dr. Leakey? Africa was not the motherland of human life on Earth. (book excerpt) In later chapters, we will examine the concept that our genesis did not occur in one location. The case will be made for 13, simultaneous, Cradles of Civilization forming a worldwide pattern. People did not emerge out of the dawn of time in one Cradle of Civilization. Human life did not begin only here at the Tigres and Euphrates Rivers, as was taught in schools decades ago. Human life did not begin only there in the jungles of Africa. If the Black Race wants to rally around its prehistoric greatness, do not assume Mother Africa was the beginning of all Homo sapiens. Rather, look to the stonework of Zimbabwe ruins! Zimbabwe (‘House of Stones’) proves that the FIRST AFRICANS were as magnificent stonecutters as the Egyptians or Incans! On the point of Dr. Leakey’s ‘Lucy,’ what matters more? Should we believe one/tiny ape-thing as our ancestor that could have been any advanced astronaut’s rejected, genetic experiment? Or…do we place credibility in the fantastic, conical, stone towers at Zimbabwe? Prehistoric Africans cut and transported large monoliths? They most certainly did. Zimbabwe’s main complex is the center of a vast system, surrounded by smaller (stone) zimbabwes covering thousands of square miles. We have not been taught to appreciate the significance of such technological advances in prehistoric times. The amazing cut and transported rocks of Zimbabwe trump Lucy. Did human life on Earth begin in our oceans? The naturalists had to ascribe some beginning point; because what was before so-called primates? Of course, it was the primordial soup that is Earth’s oceans. Fish to amphibians to primates to modern people in millions of years is the belief. How were the fish created? Then, how were the amoebas created? Maybe our very earliest, beginning point was not deep in the oceans. Another ‘alternative’ possibility exists when you consider that high technology played a crucial part in human prehistory. Maybe our very earliest, beginning point was UP above us out in space or on another planet? Keep in mind that a technique such as CLONING might not have been a mystery to the ancients. Also, the art of genetic engineering may explain a lot. Cloning could provide a real world answer; at least, a good possibility of another way life could appear on a planet. Consider when Charles Darwin lived, two hundred years ago. It was an era when ol’ time religions dominated and people really were not that intelligent. These were ignorant times, just after the 18th Century. The Church was king. Then, here come the new sciences making breakthroughs in many departments. Science was not going to close its eyes, then. Nineteenth Century educators were not going to allow blinded superstitions and thousand-year old traditions rule the day. Schools had to adopt some of the new sciences. The movement eventually led to the famous Scopes Monkey trial in 1925. Charles Darwin’s views sounded good for their times, in a ‘modern, more enlightened’ age that desperately struggled to combat the tired/stale teachings of the Church.